A hugely enjoyable debut novel that will leave you with a warm, fuzzy feeling. I loved the ease in which the story went from Civil War Ireland to Celtic Tiger Ireland. The stories in both timelines had me completely hooked. I could sympathise with the young Edith and couldn't wait to find out what happened to her. I liked Elenore. She may have been a little pathetic initially while she was under the thumb of Donnacha but when his dodgy dealings and betrayals came to light she acted swiftly and didn't look back. Seeing Elenore getting her confidence back was a delight to read. The small cast of side characters provided just the right amount of support but they also had well developed and interesting backstories. There's plenty of scope for a sequel with these characters. I'd love to revisit Cavendish and see how this group of friends are faring in 2019. 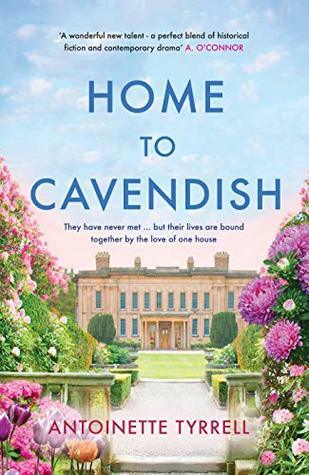 Home to Cavendish is out now and it's well worth buying print format for its gorgeous cover.